True dancing of stars …. A little more than a year ago, All Saints Lutheran Church in northeast Baltimore city suffered a catastrophic fire. Fortunately, no one was injured. As part of the recovery effort, Diakon Kathryn’s Kloset donated new office furniture to help re-equip the congregation for its continued mission in the urban neighborhood. 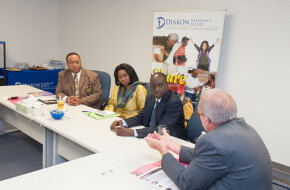 Wade Brown, executive director of Diakon Kathryn’s Kloset, and I attended the dedication a few weeks ago. It was a joyous event! The Delaware-Maryland Synod Bishop was present, there was special music, and the sanctuary was full. 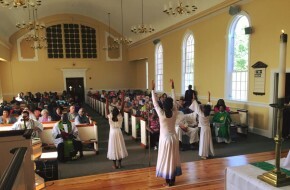 During the offering of the chancel dance ensemble, power to the keyboard was disrupted and the music abruptly stopped! The upcoming issue of Dialog, Diakon’s newsletter, features an in-depth profile of Diakon Kathryn’s Kloset, which solicits and stores corporate donations of personal care and related products and then makes those items available to other non-profit organizations to provide to people in need in their community, free of charge to the end-recipient. In a typical year, the Baltimore-based warehouse ministry touches the lives of approximately 400,000 people locally, regionally, nationally and even internationally.